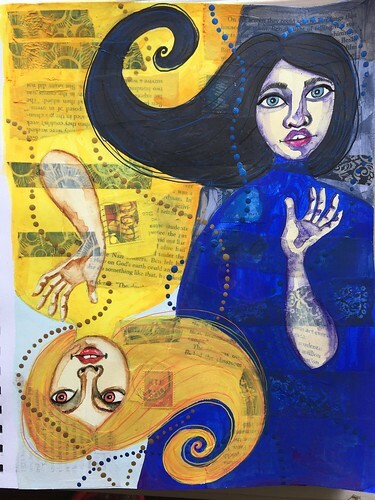 This week’s Art Journal Adventure prompt was “opposites”. I ran through a lot of ideas in my head before choosing to depict Night and Day as female figures. This was something I had tried before in my Rainbow Art Journal but I had not been satisfied with the result. This was an opportunity to revisit the subject and hopefully accomplish a better outcome. Whereas before I had worked across two pages, this time I confined the composition to a single page. To further enhance the concept of opposites, I placed the figures top to tail as I knew I had liked that composition when I used it in my most recent Red Riding Hood page. To create a bit more visual interest to the page, I adhered some collage materials as a first layer and ensured that those still showed through subsequent layers in places. While the composition and colour scheme places the Night and Day figures in opposition to each other, I also wanted to connect them, because they are cyclical, so I drew their hair swirling into the sector of the other and had the metallic dots sweep across the diagonal dividing line in places. 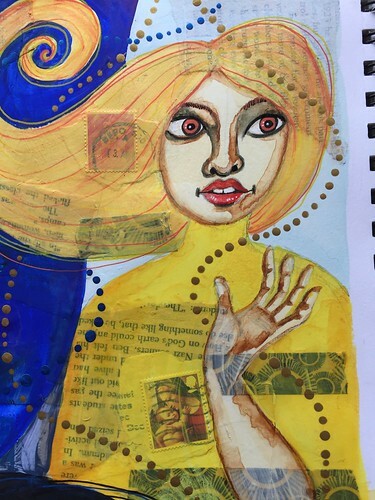 This week’s Art Journal Adventure prompt was to use a brayer or similar tool to apply paint to the page. I already had an idea for a page I wanted to create so I grabbed colours I thought would work well – grey, back, and pink – and scraped them across the page. I then added some white spatter largely because I love spatter but also because I thought it might suggest snowfall. I had been reading National Geographic magazine and spotted a trio of portraits of Japanese macaques. Their little faces really pulled me in so I knew I wanted to use them in an art journal page. I stacked them up like a totem and glued them down. My personal challenge with this page was to try and disguise the edges of the magazine paper, make it look less “collaged” once I painted over it. I, therefore, applied some thick matte medium over the top of the collaged photographs. 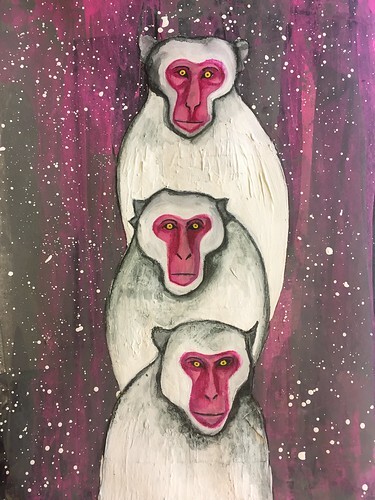 Painting over the photo portraits, I wanted to make the colours more stark so I made the fur white and the faces brighter pink. 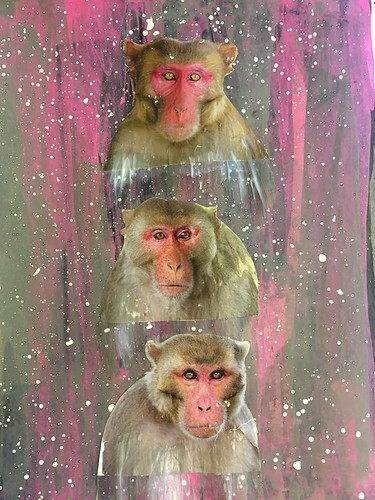 I think I managed to maintain the personality of the monkeys’ faces and I also succeeded in my personal challenge to conceal the edges of the collage. I have decided that these macaques are queuing up waiting for their turn to bathe in the hot water as the snow falls down. I have always thought that looked to be wonderfully cosy and appealing. Last week’s Life Book lesson was taken by Annie Hamman. I really love Hamman’s paintings and enjoy watching her process but it is a style and methodology I can never get to work for me as I am neither painterly or loose enough in the way I handle paint. 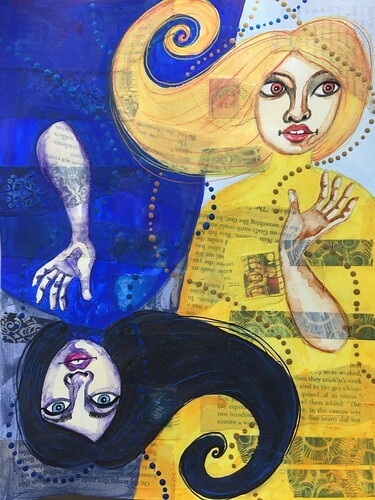 I have, therefore, really enjoyed the previous Annie Hamman lessons I have worked on but I always end up with something much more rigid and controlled than the anticipated outcome. This lesson was no exception. I enjoyed all of the techniques deployed in the lesson, such as painting over collage and painting negative space, but I was neither intuitive or loose enough in my mark making. That’s OK though. That way of creating just isn’t me. What was disappointing was that my choice to use blue for underpainting and layering up the shadows of the face didn’t dissipate enough in subsequent layers and the flesh tones ended up sallow and sickly looking as a result. (Incidentally, the phone photo makes the colours much paler than they are in real life because the light levels have just been so dreary here lately.) 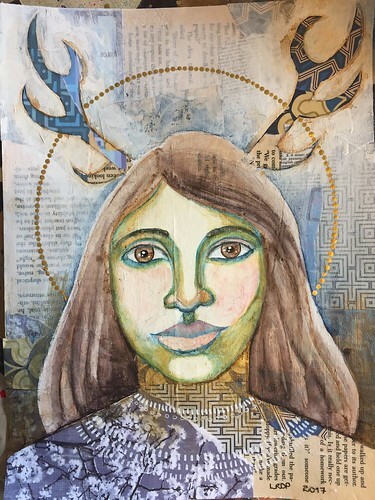 I am, however, happy with the negative painting around the antlers, the pushing back of and forward from the collage layer, and the gold of the halo. I think this is another one of those lessons I will attempt again, perhaps in my art journal, as I liked the approach and have hopefully learned something from the underpainting oops. For this week’s Life Book lesson, the tutor was Effy Wild. 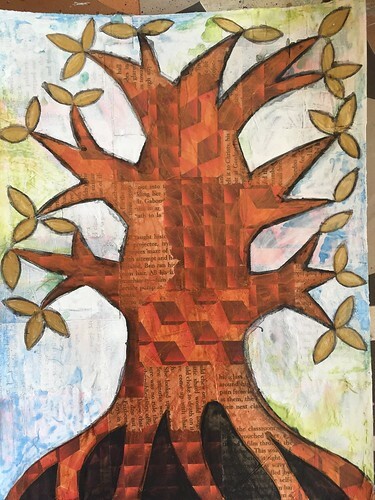 The visual elements of the lesson were connected to some introspection but I mostly choose to gloss over the more art therapy aspects of Life Book and just focus on the art. I also did not have time to view the video demonstrations so I relied on the accompanying PDF to provide me with an understanding of the steps involved. As always, my finished outcome looks little like that of the tutor but I utilised techniques and approaches that she demonstrated. I think the finished treeis reminiscent enough of a plump baobab tree that I wish I had thought of the resemblance sooner in the process and made it completely like a baobob. It was at its core an exercise in patchwork collage and negative space. 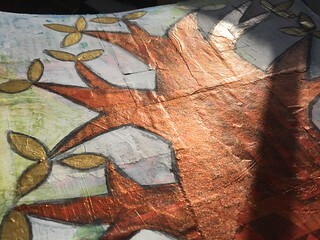 I used bronze paint over the collage layer for the tree trunk and gold for the leaves so that it would glint in the light and because I look for any excuse to use metallic paints. The tutor’s version incorporated text. I wasn’t feeling that way inclined but do feel my piece lacks a focal point. I just need to ruminate on it for a bit and return to it once I have an appropriate epiphany. I managed to scrape together some time in which to tackle last week’s Life Book lesson. I did, as I often do, skip some steps and take some short cuts but I did follow the essence of the lesson. The lesson was taken by Ivy Newport whose encaustic artwork has impressed me for quite some time. 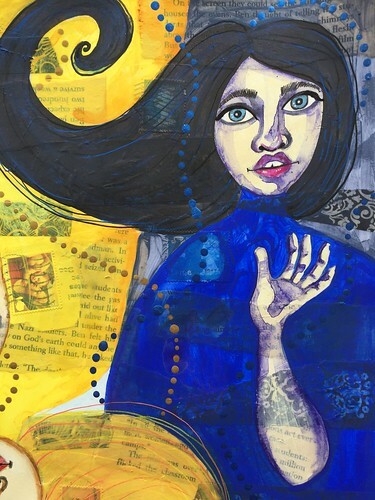 This particular lesson functioned for me as an introduction to encaustic art but – as eager as I am to give that technique a try some time – there was absolutely no way I was going to eke out the time and organise the resources to incorporate that layer. Some time I will have to give it a whirl but that time is not now. 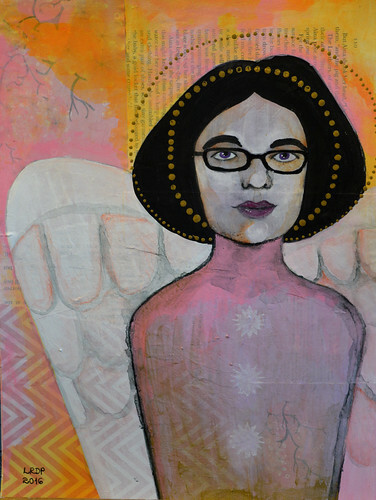 The idea of the lesson was to fuse a self-portrait with the figure of an angel and it was also another opportunity to try paint over collage. I find sometimes painting over collage works well for me and other times it really doesn’t. I have to get better at observing why my process goes one way or another. As it happens, this one fell somewhere in the middle – I didn’t get any annoying bubbles or ridges in the wrong places but I wish I had fewer straight edges among the collaged papers and instead had rougher torn edges. I have not worked in pink or orange for a while so I challenged myself to use those colours. I also challenged myself to keep the spectacles in the self-portait instead of cheating and depicting me in a way I only look when sleeping or showering. When my husband came home and saw this piece on the easel, he congratulated me on the strong likeness I had achieved in my self-portrait. I had to laugh. 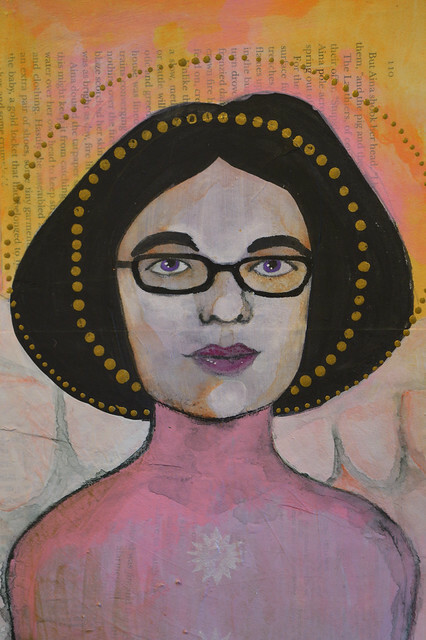 Of course it is a good likeness: I painted over a photograph of me. 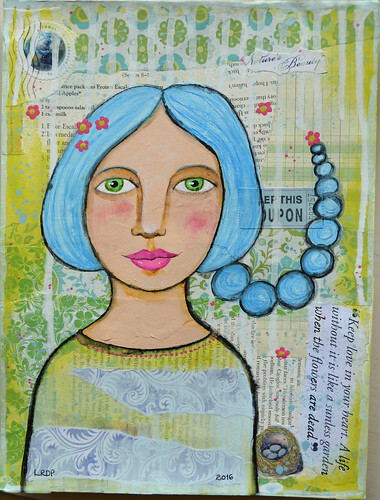 Last week’s Let’s Face It tutorial was a paint over collage lesson. It was taken by Toni Burt and we had actually been led through her process for creating a collaged background as a mini-lesson a few months ago. I really liked the collaged background as it was a bit more thought through and intentional than my collages tend to be. Instead of just tearing up and sticking down paper, I was actually thinking about relationships between elements. I should have thought a bit more carefully about the eventual composition, however, as I ended up with a significant bump under the figure because of the ticket stub. Never mind. Another learning opportunity. 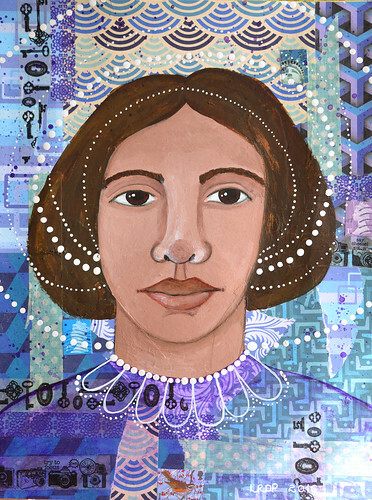 The object was to paint a whimsical figure on top of the collage layer. Burt used oil sticks in her piece but I neither own or have a desire to own oil sticks so I improvised and used Neocolor II crayons to shade the face. It was a welcome break to be working in this more illustrative style again, not having to be concerned about accurate proportions and facial features and all that jazz. I may be guilty of over-simplifying but time is ever my nemesis.